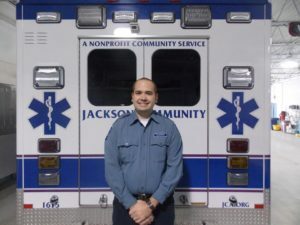 Donald “Don” has been proudly working at Jackson Community Ambulance (JCA) as a paramedic since 2012. Since 2011, Don has also served his community by volunteering on the Columbia Township Fire Department as a paid-on call firefighter. Don’s is well known for his conscientious work ethic; something he has developed because of his very close family and five years of service at JCA. Don is a shining example of what a paramedic at JCA should be. Don’s character and outstanding work ethic make him an easy choice for this award. Don is selfless and his supervisors know they can always rely on him to go the extra mile to get the job done. One fall afternoon, Don was in quarters waiting for that next call to come in. Soon the tones went off and he was called to the residence of a local woman with difficulty breathing. Upon arriving, Don found the first responders working hard on a woman who was only breathing four times a minute. Don and his partner immediately began to assist with ventilations and gave the patient medications to help open her airway. After placing the patient on CPAP, she began to have purposeful movements and was transported to the hospital, where she went on to make a full recovery.